When starting a new cloning project, just like when you start a road trip, it’s a good idea to have a map. 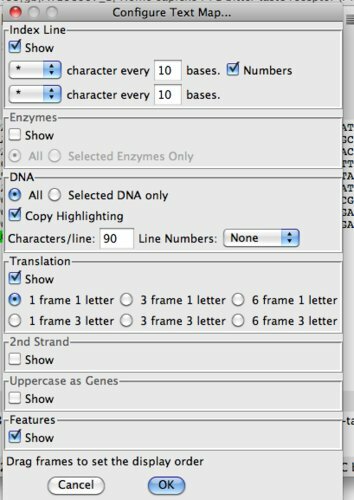 When you are cloning a DNA fragment for which you know the sequence, exploit this information to draw yourself a good map to keep track of anything sequence related. Since we are cloning a known human gene, we can pull the sequence out of a database. 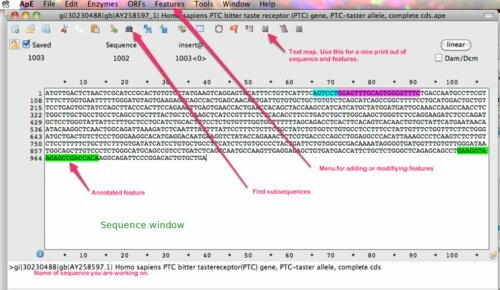 You could just print out the sequence and draw in useful features (coding sequence, primer binding sites, restriction enzyme sites etc.). However, you can take advantage of sequence manipulation software to make this job easier and the output easy to relocate and share. There are many software packages for annotating sequence. We are going to use ApE plasmid editor. I have chosen this because it is a) free, b) easy to use, c) runs on Mac or pc. ApE is installed on the lab computers; or if you prefer to use your own laptop, it is simple to download and install. You will need to use the protocol Annotating a sequence with ApE to complete this exercise. Simply go to NCBI, search for accession number AY258597, and click on the Nucleotide database link (there should be a 1 next to this database, indicating there is a single record in this database with this accession number). Once you make sure you have found the correct database entry, there is a link near the top labeled FASTA. Click this link to get the sequence in FASTA format. Copy the sequence including its definition line (starts with a greater than arrow “>”) and paste it into a new word processing file (any program will do). You will need this file repeatedly over the semester, so put it where you can easily access it again (i.e. not just on the lab laptop). Use the protocol Annotate a sequence with ApE. For your convenience, here is a screenshot of the program with the tools we will be using pointed out. Check that the sequence you have downloaded is the correct by asking the program to look for ORF. If you have the correct sequence the entire sequence should be a single ORF. Annotate the PCR primer binding sites. For the right PCR primer (PCR R primer) you need to check the Reverse Compliment box (Rev-Com). This is because the right primer is actually the reverse compliment of the DNA sequence you are using. Check that you have 3 features annotated by going to Features>List Features. 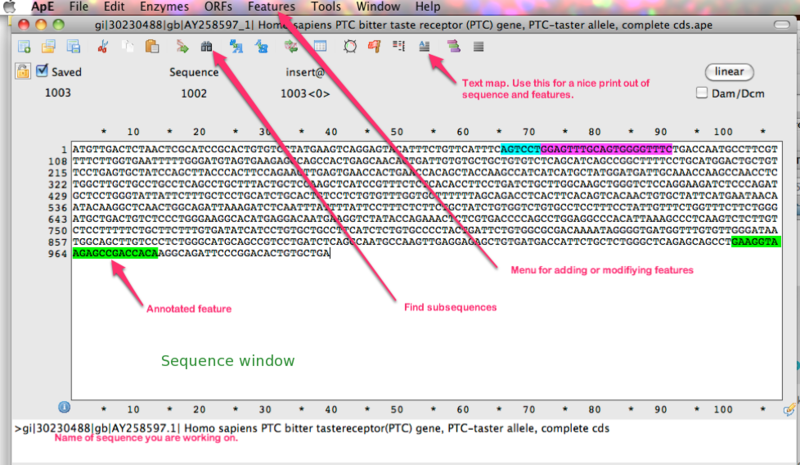 Print the annotated PCT gene (set up the configure Text Map to match what is pictured below). Attach the printout to your notebook (I will look for it there to mark it).